The weather is warming up as we race toward those lazy summer days. I, for one, CANNOT wait. Here at the PTC office, I find myself daydreaming of sunny afternoons, drinks with ice, and actually craving salads (weird, right?). To fight my plummeting productivity, I thought I’d channel my anticipation into a fun blog. Keep reading for an event recap from last summer. This Seattle corporate team building event for Virtuoso takes us to Willie Green’s Organic Farm — it’s everywhere you want to be. Virtuoso host, Kari Edwards, found us through something as simple as an internet search (Yay for good SEO!). 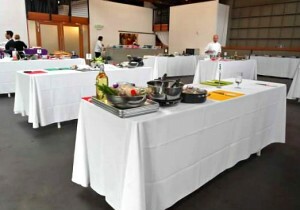 After falling in love with the variety of team building options we offer, she decided on our Cooking Farm-to-Table event. Despite a brief snafu with the date, PTC event planner, Beth, had everything under control. According to Kari, “Beth was great to work with. She was very responsive, and patient when we had trouble with a date change unexpectedly.” Way to go, Beth! If we’ve learned anything from 13+ years in the event planning business, it’s that things do not always go according to plan. Beth is a pro at rolling with the punches! When clients describe themselves as “Specialists in the Art of Travel”, you know they’re going to be a lot of fun. The group arrived at Willie’s farm at noon on a beautiful Thursday. After half an hour of mingling, sipping wine, and noshing on a fabulous antipasti platter with crudite of baby radishes, carrots and cultured butter, the group set off for a tour of the property. Jeff, the farmer leading the tour, brought everyone back promptly at 1:00 for the PTC cooking demonstration. With everything running smoothly, we were off to a great start! One of our newer Sous Chefs, Ben, showed our guests a few tips & tricks related to the day’s menu. Kari later reported, “Many of my coworkers mentioned how much they enjoyed the cooking technique demonstrations by Ben.” Great job, Ben! 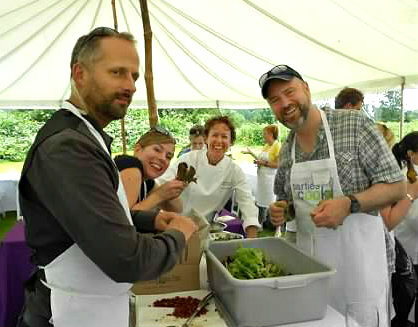 Our travel specialists were then split into teams to work on the day’s mouthwatering farm-to-table menu. 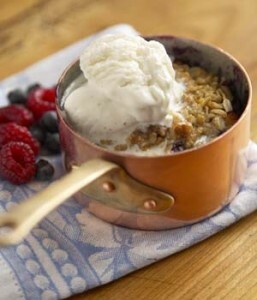 Favorite recipes included Griddled Corn Cakes with Bacon and Sour Cream, Baby Lettuce Salad with Fresh Cherries and Tarragon Crème Fraîche Dressing, Chicken Cooked Under a Brick with Arugula, Preserved Lemons and Green Olives, and a Summer Berry Crisp with Aunt Polly’s Hot Cream Sauce. According to Lead Chef, Carolyn, “They loved the event! Everything from the farm to the food to the staff to the recipes. We added in the farm’s baby carrots and radishes for the antipasti, lettuces for the salad, and arugula for the chicken filling. The food came out so good!” Host Kari could not agree more. 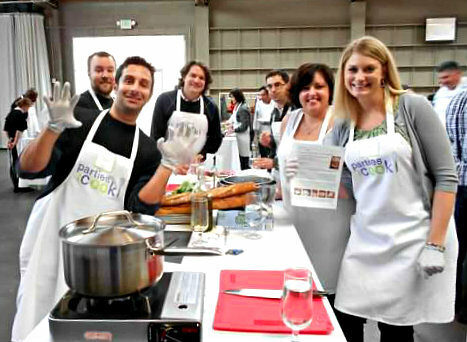 She found that her team “loved that they actually got to cook, vs. a lot of cooking classes now days that are more demo than anything… Everyone loved the food, loved being introduced to new ingredients (like preserved lemons), and are clamoring for the recipes.” Lucky for them we send out all recipes to guests post-event. Just be sure to leave us your email address! Before long, our team had the 6 cooking stations set up. We welcomed our guests with an antipasti platter and beverages. 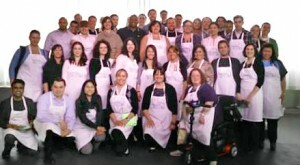 As guests put on their aprons, they quickly realized that they were about to face off in a cooking competition. Which team would make the best dish using Parties That Cook’s recipes? Only time would tell. Excitement mounted as I explained how the competition would unfold, demonstrating tips and tricks that would come in handy in their cooking and providing suggestions on how to win (best execution, presentation, bribe, etc.)! Soon enough, guests were assigned to their teams, had washed their hands, and the cooking had begun! While our inspiring Kitchen Challenge playlist pumped out rockin’ tunes, the PTC chefs circulated through the room making sure everyone was having fun and learning new cooking techniques. Our Server, Elizabeth, captured action shots of the guests while they cooked (to be emailed to them the following day), and made sure everyone was staying “hydrated”. 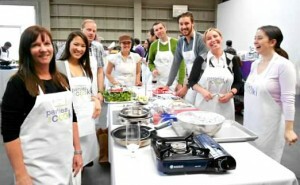 Delicious cooking aromas filled the air, and a few staff members at the venue, 415 Westlake, poked their heads in to see what all the excitement was about! One team made fresh Burrata, a delicious creamy version of mozzarella, on Grilled Bread, while another creatively executed mini Philly Cheese Steaks with Gruyere Cheese Sauce (yum!). There were also Little Fish Tacos with Chipotle-Lime Crema, Lettuce Cups with Minced Gingered Chicken and Hoisin, Shiitake-Scallion Potstickers, and Ahi Tuna Tartare in Toasted Won Ton Cups. After an hour, the clock stopped and teams artfully plated their dishes for the presentation table. Each team chose their most charismatic member to present their dish and argue why they think they should win. 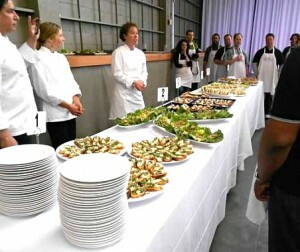 After the presentations, guests were invited to enjoy their own helping of Small Plates. The room was quickly filled with the sounds of “Mmmm”. Meanwhile, the chefs tasted, analyzed and critiqued each team’s dish back in the kitchen. The tension was high as the guests wondered how their dish scored. Like always, it was a difficult decision to make. Everyone did an excellent job, but a winner had to be chosen. Ultimately, it came down to the Philly Cheese Steak Team! They executed the recipe very well, worked together when troubleshooting how to get the right sauce consistency, plated up their dish beautifully, and made a second platter with additional toasted bread and cheese sauce (who doesn’t extra love bread and deliciously melted cheese sauce??). Congratulations, Philly Cheese Steak Team! Each team member was awarded one of our More Sumptuous Small Plates Recipe Decks containing 30 of our favorite recipes, easy-to-read and all in one little box. There are even photos on the cards to show you how the dish will look! Hopefully everyone will be inspired to bring what they learned back to their own kitchens to share with friends and family. We received many thank you’s and comments about how unique this event was. We love hearing that! 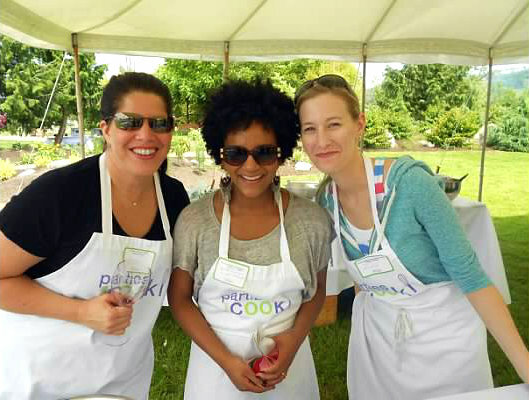 Thank you, Bri, for bringing your Microsoft group to join us in a fun and spontaneously competitive cooking party! Hope to see you again soon!